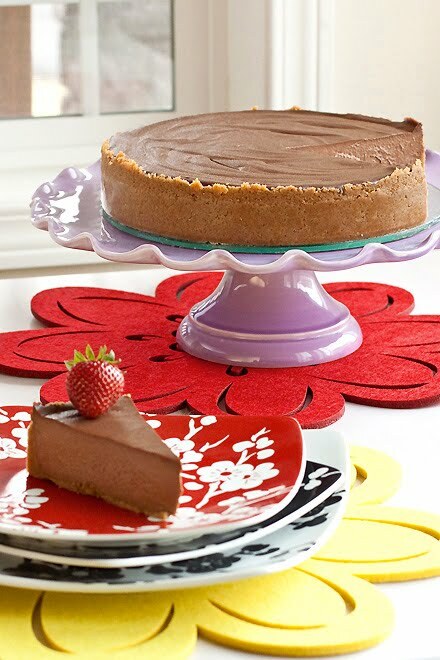 This wonderful creamy dreamy deeply chocolate cheesecake’s roots come from Rose Levy Beranbaum’s Cake Bible. 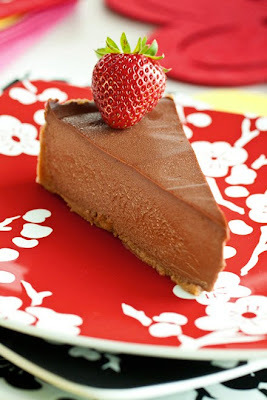 Several years ago, Dishboy Scott’s family turned it into a food processor chocolate cheesecake. When I got my paws on it, I made a few adjustments and reorganized the recipe. Now I’m not sure whose recipe this is. So I’m calling it “The People’s Chocolate Cheesecake”. Much like Kate Middleton will become the people’s princess in about eight hours. The last people’s princess, Diana, married when I was 5-years-old and I still perfectly recall the wedding. I was a wild spirit, and it was the last summer before that boring old kindergarten class would forced me to sit and learn, instead of running around with the neighborhood kids and playing in the dirt. As the daughter of a pilot and a nurse we were solidly middle class, and I stared at our little television in disbelief witnessing opulence I’d never experience. Princess Diana floated up those beautiful red steps in a gown fit for a fairytale storybook. I loved watching her enter what I thought at the time was a castle. Her castle. It was certainly the most beautiful building a kid from Walla Walla could ever imagine. Diana and Prince Charles’ wedding was also the first wedding I’d ever witnessed. How’s that for high standards? From that moment on I realized princesses were real. Not just in the many piles of books I made my parents read to me. It gave my childhood a tie between my imagination, stories and reality. Cinderella all of a sudden didn’t seem so far fetched. In eight hours I’ll be sleeping, but I’d still like to see the royal wedding. Maybe afterwards, I’ll celebrate like a 5-year-old by gulping down fruit punch and tearing across the neighborhood on my bike. 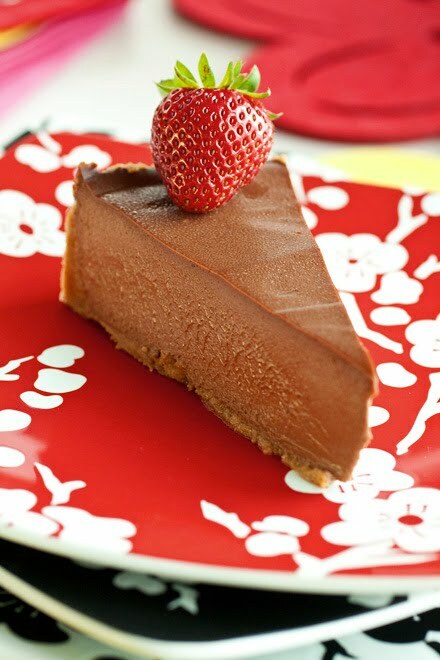 This rich mousse-like cheesecake is prepared in just a few minutes in a food processor. If you don’t have a food processor, crush the graham crackers in a bag, and mix the filling with an electric mixer. 1. Preheat the oven to 350 degrees. Wrap the outside of a 9” springform pan with foil. Place the pan in a rimmed baking sheet. 2. Process the graham crackers, sugar and melted butter together in a food processor until you get mostly fine crumbs. Press the crumb mixture into the springform pan base and up the sides about 2 inches. 3. Wash and dry the food processor bowls. 1. Break up the chocolate into a microwave safe bowl. Cook it on high in the microwave in 30 second increments, stirring after each until melted. Set aside to cool slightly. 2. In a food processor, cream together the cream cheese and sugar. Add the eggs, vanilla extract and salt. Pulse to combine. Add the sour cream and pulse well to combine, scraping the bowl as needed. Add the chocolate and puree to combine. 3. Pour the cheesecake mixture over the crumb crust. Place the rimmed baking sheet in the oven with the cheesecake. Pour very hot water into the baking sheet until it’s about half full. 4. Bake for 45 minutes. Turn off the heat and set the timer for 1 hour. Do not open the oven door. Once finished, cool on a cooling rack and chill for several hours before serving. Recipe adapted by Laura Flowers from Scott Bader from Rose Levy Beranbaum. Pictures by Laura Flowers. Oh yes, I remember that wedding too. I was so excited to watch history in the making, but I had to get special permission from my mother to get out of bed in the middle of the night to watch. This time around I hoped to share that same experience with my girls, but being the 2011 teens that they are, they said they're rather sleep, TiVo the wedding, and watch it tomorrow night. So much for bonding as history is being made. Such a beautiful cake! The texture looks absolutely perfect! 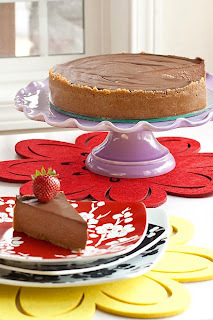 The mousse filling in this cheesecake looks absolutely decadent...and FIT for a princess! See, you've got some opulence in your life after all! A cheesecake fit for royalty! Looks incredible, Laura!